This atomic-force microscopy image shows wrinkling in a single-wall carbon nanotube membrane; the inset shows an optical reflection micrograph of the membrane without any strain. 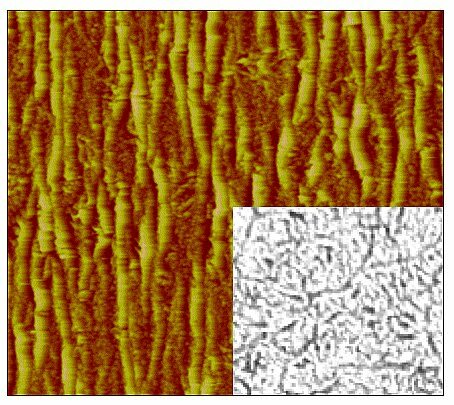 The random arrangement of the nanotubes shown in the inset creates conductivity, but wrinkling can disrupt that. Each image is 40 micrometers in width. A closer look at a promising nanotube coating that might one day improve solar cells has turned up a few unexpected wrinkles, according to new research* conducted at the National Institute of Standards and Technology (NIST) and North Dakota State University (NDSU)—research that also may help scientists iron out a solution.